Oh, garlic. How do I love thee? Let me count the ways. You can be diced, sliced, minced, mashed, crushed, ground, pickled, fried,stuffed, used to flavor oils, and most importantly, garlic be roasted. So,That is the subject of today’s post. You can use garlic in just about any way imaginable, However, the same problem always arises, if you don’t cook it long enough, it is super pungent, spicy, and can totally take over any dish. Trust me, I know. While recipe testing my roasted red pepper pasta sauce, I had one batch that had a very strong, laden garlic aroma that totally killed the complexity and subtleties of the sauce I was trying to make. See what I mean? OK back to the subject at hand. If garlic is cooked it too long it becomes bitter, unforgiving, and isn’t going to be a nice way to end an otherwise delicious dinner. So how do we find the perfect, flavorful, and very versatile balance to this challenge? We roast it. Why? Well, like so many other things, cooking can concentrate and draw the natural sugars to the surface, in the case of garlic — when roasted it becomes soft and can be spread like butter, it has an incredible aroma, and doesn’t retain any qualities of being overpowering. Is is time to for me to stop gabbing about garlic, and get the garlic going? 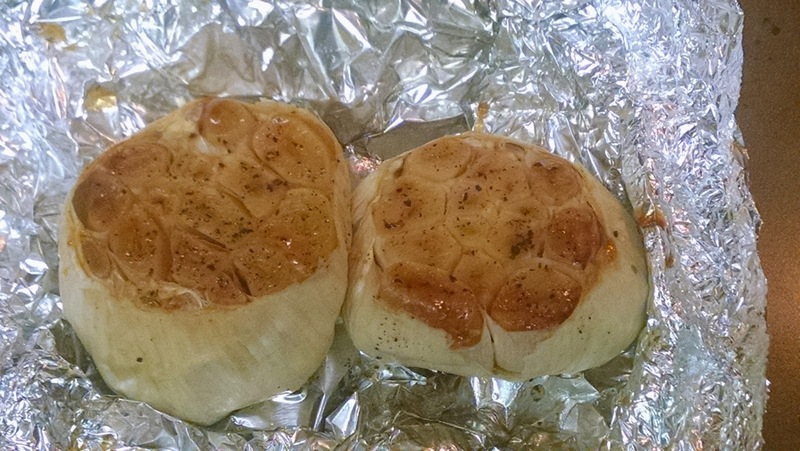 Please note that I did two versions of this roasted garlic. The first version roasted at 400 degrees for 52 minutes. The second version was done at 425 degrees for 35 minutes. I was hoping for a big difference in the color, but alas, it was the same. 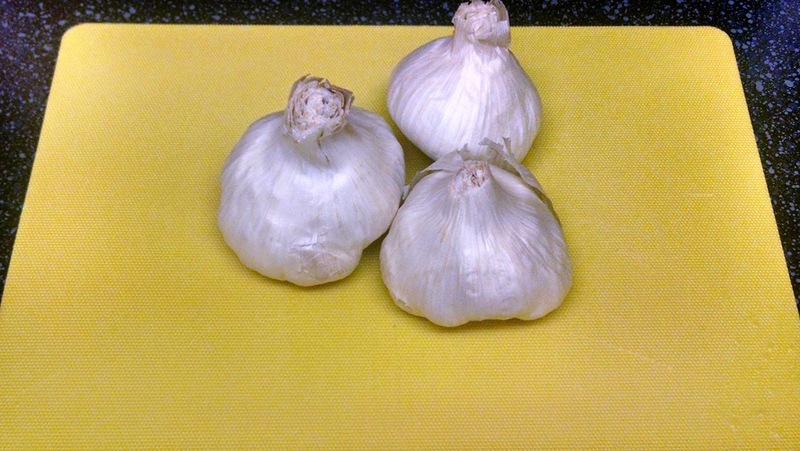 Trim off top of garlic head about ¼-½ inch, so cloves are exposed. Drizzle with olive oil, salt, and pepper. 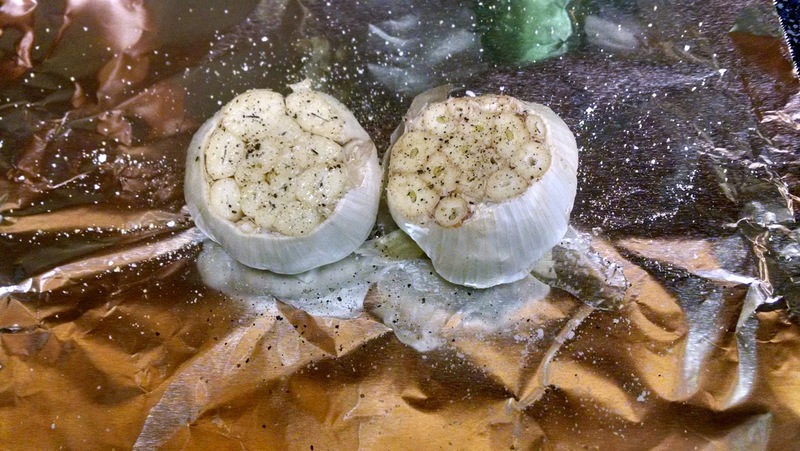 Wrap the heads of garlic in a foil packet. Place foil packets on a baking sheet for 35-50 minutes, until cloves are browned, soft, and tender. Allow to cool before extracting the cloves. Remove cloves with a fork or squeeze out cloves. Ready for some pictures? Cool, I am too! Alright, here are your garlic cloves on a cutting board ready to meet their fate. 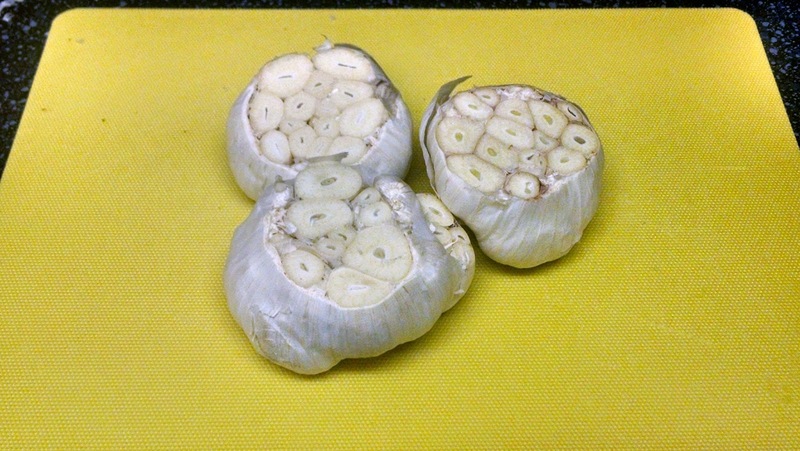 Cut the tops off the heads of garlic so all the cloves are exposed. Boom. There you are. Let these cool after they come out of the oven before you excise these bits of deliciousness. So, what can you do with the pearls of deliciousness? Again, the list is endless, but let me give you a few ideas. Perhaps you could chop them up and stir it into a little homemade mayonnaise, perhaps? Remember, making mayo at home is quick and easy. 🙂 Let’s see, what else? Spread the clove onto a cracker or a nice piece of a toasted baguette. Also, you could mix it with some soft cheese and use it as a sandwich spread or it can stand on it’s own. Last but not least, and this suggestions isn’t for the timid, you can consume the cloves just as they are and treat them as your favorite single wrapped candy. Also, this is a great deterrent to have to speak to an unwanted guest or if you want to make a lasting impression. I hope you enjoy this as it is another great way to deliver flavor and have a blank palate in which you apply chose to apply these cloves of roasted garlic.